how much I love the people I have met from Freedom Cardboard? Oh, well I do. On the message boards they do a ton of group case breaks of all different products with All In Cards (@allincards on Twitter), and they recently broke a some 2010 Topps Tribute . One of my new friends, Lisa was lucky enough to pull a Robinson Cano /50 auto out of her stuff. Lucky for me she is a super nice person who sent me the card a few days later. So the score is Lisa 1, Marie 0 but I wrote an I.O.U. and will hopefully pull something I can send back in return. There is something interesting about this autograph. 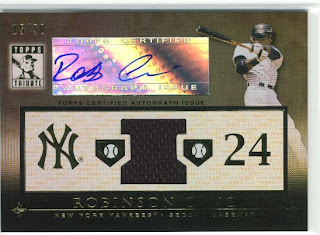 If you click and enlarge the scan, you can see what appears to be a mistake by Robbie signing his name, he left the "b" out and went back trying to make it look like he didn't, or the end loop of the b just got carried away. 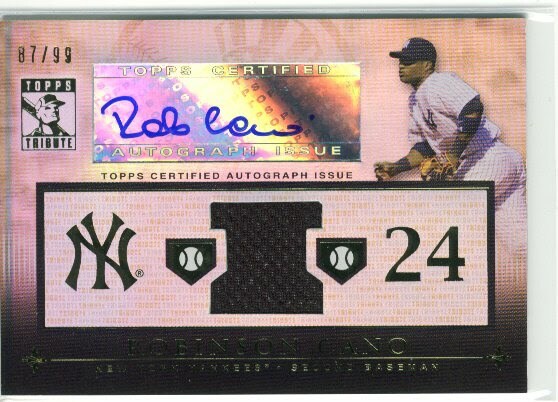 Normally this is the sort of thing that makes me want to punch the Quality Control blind mice at Topps, but the signature kind of grew on me. It is unique in it's own way, and it's a Robbie writing error (maybe), which makes it a little more charming. I also picked up one other card on eBay and it was actually one night in the hotel room at the National I purchased it. Yup, I bought a card on eBay after spending hours surrounded by them. Did you not read the title of this blog/website? This card was picked up on a dirt cheap buy it now. It was the lowest BIN I have seen on these, and I might have purchased it even if I already had it. For those of you that don't know this, Robinson Cano has FOUR variations in this set, all with 4 color versions (Face palm). Due to poor planning and over anxious behavior (as usual), I had no plan of attack on this years cards and ended up with one of each right now. I would love to end up with a rainbow of one version but I am not sure how realistic that is at this point. If anyone has any of the Robinson Cano auto's for trade please let me know.